This picture was painted in 1968, but its title recalls happy days of long ago spent on the Greek island of Poros. 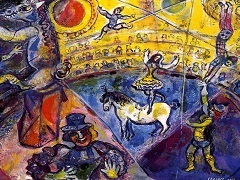 In 1968 Chagall was engaged in the completion of the vast Odysseus mosaic for the new Faculty of Law building in Nice, and being thus occupied with the Greek theme and occasionally looking through the gouaches he had made in Greece, he may have remembered his trips to Greece- as if looking through a window. 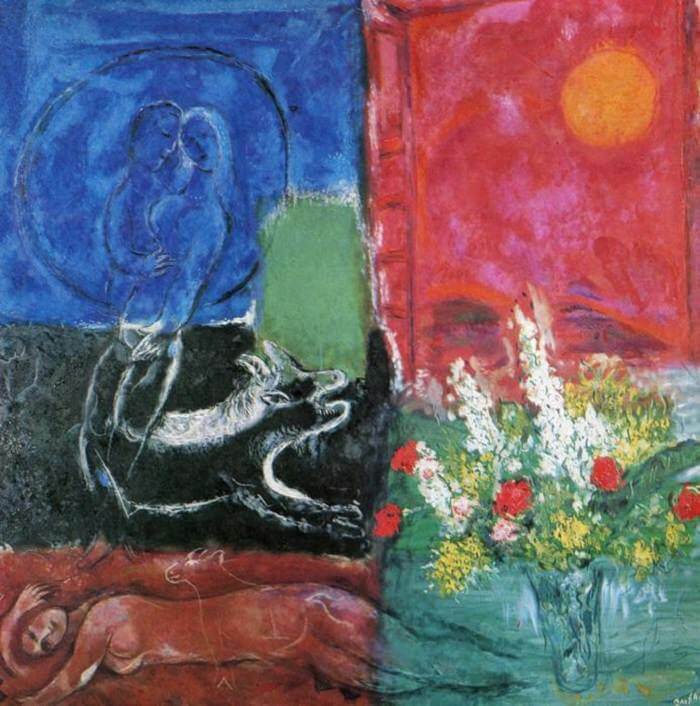 Indeed, within the almost abstract arrangement of color fields, on the right-hand side of the picture within the expanse of purple, Chagall has drawn an open window, in which appears the vague shape of an island under the hot sun of Apollo. 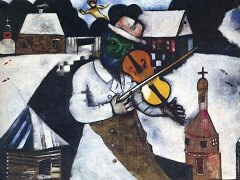 Chagall had visited Poros in 1952 and again in the autumn of 1954. 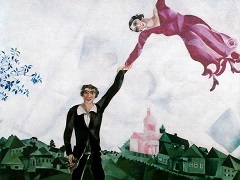 The publisher Teriade, Vollard's heir and thus the inheritor of the series of etchings Chagall had made for Vollard, had urged the painter to illustrate the antique pastoral romance Daphnis and Chloe with color lithographs. 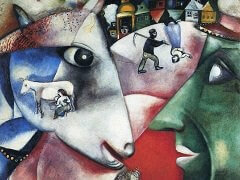 Teriade wanted the Greek island as a background to these illustrations, and invited Chagall to come and live in his house on Poros. For a while the painter was undecided, for at that time the world of Greece was unknown to him, but, just as he had felt it necessary to go to Palestine before starting on the biblical etchings, he had also felt it was essential for him to become acquainted with the location of his new and very intriguing task. His first journey to the island took him through Athens and Delphi. The impression was overwhelming. The light of Greece breathing over the simple structure of the landscape, with both forming a perfect background to the graceful severity of the archaic sculpture, captivated him completely. And he now realized that this world of Greece was the other pillar supporting Western culture, which until then the temple of Jerusalem had obscured from his view. He never forgot this. 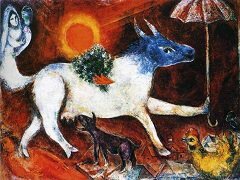 At that time he made the first gouaches and pastels- simple landscapes- but these were followed by the gouaches of the journey of 1954 which later served as designs for the lithographs to Daphnis and Chloe. 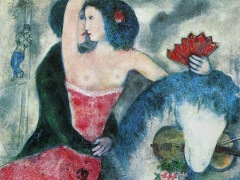 He used the antique theme once more in 1958 when he designed the scenery for Ravel's ballet Daphnis and Chloe for the Paris Opera. Then it receded for almost ten years. But the poetry of the world of Greece and the memory of that wonderful "breathing" light lingered in his heart and mind, resurfacing now and then, particularly in landscapes made in Vence; The Sun of Poros bears witness to this process.